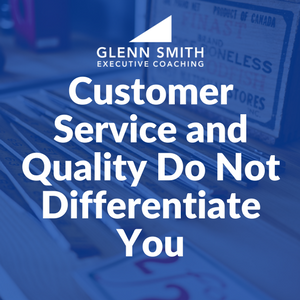 Frequently when I speak with owners of small businesses and ask what differentiates them I hear “Our service” or “The quality of our work.” I appreciate what they are saying but here’s the problem with that – everybody says the same thing! 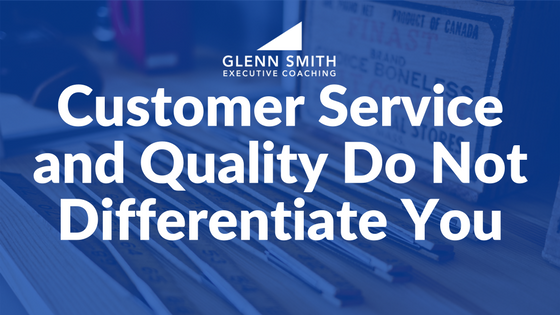 There’s really nothing about quality and customer service that differentiates you from your competitors. In fact, our prospects don’t even hear those words as differentiating because they expect quality and service. Quality and service do not get new customers. They only enable you to keep the customers you have. Knowing and loving your customers is a given, not a difference! Quality was the big word in the 90’s. In fact, in 1993 there were 422 books in print with “Quality” in the title. Today there are half as many. The promise of quality doesn’t make the sale! Customer service is the same way. It’s expected! Outstanding customer service does not get you into the end-zone; it just keeps you in the game. If you want to attract new customers away from your competitors you’re going to have to offer them more than the promise of quality and service. More than 40% of customers studied who claimed to be satisfied, switched suppliers without looking back. 89% of people who owned cars from a certain manufacturer said they were very satisfied, and 67% said they intended to purchase another car from that manufacturer – but less than 20% actually did so. Think about your unique selling proposition. If you’re focusing on quality and service, think again. That’s what everyone else is saying and what every customer is expecting from everyone! You must find something else – some point of differentiation – that is unique to you and your industry. If you are struggling to know how to differentiate yourself, don’t feel bad. This is one of the toughest, but most critical disciplines you must accomplish. A business coach can help you. Be sure you know the best practices of your industry. Then take it one step further! The promise of good customer service and quality products or work will not win you new customers! Everybody promises that. You must differentiate yourself! This is a great explanation of the #1 problem I face with new clients that haven’t had any sophisticated advertising experience. This is ALWAYS what they want to talk about in their advertising, and it’s always a battle to educate them on precisely what you’ve talked about here.